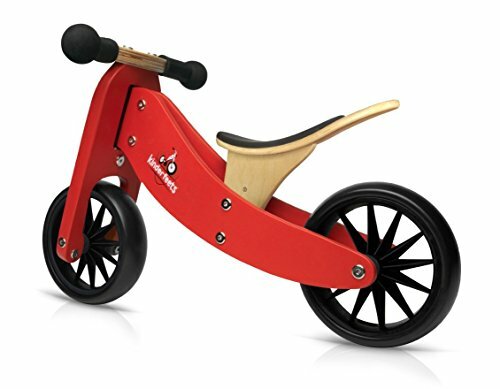 Derived from the Dutch for "children" and "bicycle," a Kinderfeets is a wooden push bike designed to ease the transition to pedal-powered bicycle at a toddler's comfort level. Kinderfeets' tires don't require air. Plus, Kinderfeets' colorful chalkboard finish provides a reusable canvas for children to exercise their creativity. Older now, Sebastian rides a regular bike with ease and confidence - all thanks to the push bike his father designed with him in mind. The patented Kinderfeets Tiny Tot is a 2-in-1 bike that easily converts from a tricycle to a 2-wheel balance bike! 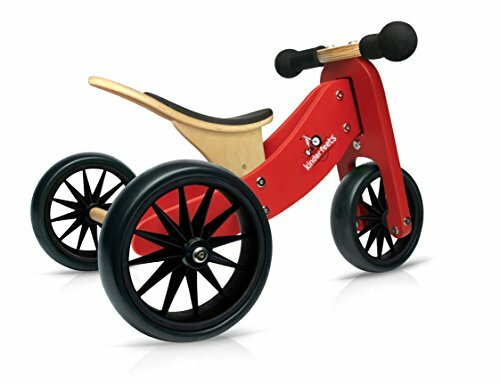 Designed for "tiny tots" ages 12 to 24 months, Kinderfeets Tiny Tot starts off as a tricycle and when needed it easily converts into a 2-wheel balance bike. It's the smallest 2-in-1 balance bike on the market!